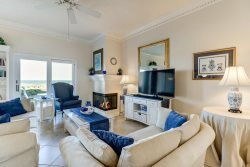 Create your next memory in this luxurious oceanfront condominium, with upgrades throughout this beautiful 1st floor unit. There are limited views of the Atlantic Ocean. Watch the sunrise and beautiful moon setting over the ocean, from your private patio or you just may be greeted by one of our many gopher turtles walking the sand dunes looking for food and friends. Located adjacent to The Ritz Carlton and The Golf Club of Amelia, Ocean Place is a private gated community with 24/7 security and is located on the southern end of Amelia Island. You master bedroom has a king size bed with a separate tub; walk-in shower and good size open closet. The queen guest bedroom also has a private bath with a tub/shower combo. This unit has a fully stocked kitchen with a breakfast bar. The living room/dinning room is open with views of the ocean and a sleeper sofa for that extra overnight guest. This non-smoking unit has 2 sets of sliding glass doors out to your patio, one off the living room and one off the master bedroom. Book your stay with Amelia Rentals and let us help you make everlasting memories. Sleeps 6- King & 2 Twins w/ sofa bed. This unit allows 1 parking pass only.